The Individual Right to Keep and Bear Arms: Your Right - Your Duty. 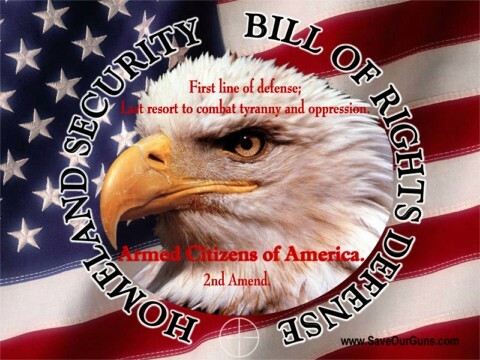 The Individual Right to Keep and Bear Arms is about Freedom, Self Defense, Safeguarding the Bill of Rights, and Protecting against Government Tyranny and Oppression. The 2nd Amendment is NOT about sport, games, or hunting -- it's about controlling the deadly force of governments & tyranny. As government officials continue to destroy our Constitutional Republic and trample our Bill of Rights, there is no real issue about whether you have an Individual Right to Keep and Bear Arms. We are Americans, it is our birthright. There are those in office who seek to disarm Americans. They provide aid and comfort to our enemies. They provide the enemies with safe passage into our cities to kill Americans. These "officials" are traitors. Americans should be demanding treason trials! These enemies should be tried for treason, and upon conviction (with Constitutional due process), suffer the historical penalty for treason (hanging). Am I willing to stand with God? Am I willing to stand against tyranny and oppression so that I and my children can live free? And, as a last resort, am I willing to die fighting for God, our God given rights, and liberty? Only by answering such question, will we know whether America will survive as a free country, and whether each of us will die as free men, or as slaves. "The Second Amendment isn't about hunting deer, it's about hunting politicians." The Individual Right to Keep and Bear Arms is about Freedom, Self Defense, Safeguarding the Bill of Rights, and Protecting against Government Tyranny and Oppression. The 2nd Amendment isn't about sport, games, or hunting -- it's about controlling the deadly force of governments & tyranny. The treason by our own government officials bring into sharp focus the relevancy and critical need for the 2nd Amendment. Yet, the media and politicians not only seeks to ignore this reality, they use images, lies and symbols in their never ending attack on that very provision of the Bill of Rights which actually protects and guarantees that the entire Bill of Rights will remain for future Americans. What can you do? First, learn about the "Real" purpose of the 2nd Amendment. Then read news events which show the present day tyranny and oppression of governments around the world. Use this information to instruct fellow citizens about the true meaning of the 2nd Amendment, and to show its continued application today. Next, help fight back against those false images which portray guns as "evil". Such images are posted everywhere and routinely linked to the word "crime". In government buildings, court houses, airports, and business buildings, guns are shown with a Red Line through them, or other negative environments. Those mental images are warfare against your individual gun rights, your safety, and freedoms. Each such image is embedding in the mind of children (the voters of tomorrow), false information. Such jeopardizes not only their Freedom, but yours, and that of generations to come. Start NOW and use positive and thought provoking mental images to not only defend your gun rights as "YOUR RIGHT", but to take the offensive -- it is "YOUR DUTY"! As people of action and purpose, we must take the offensive. 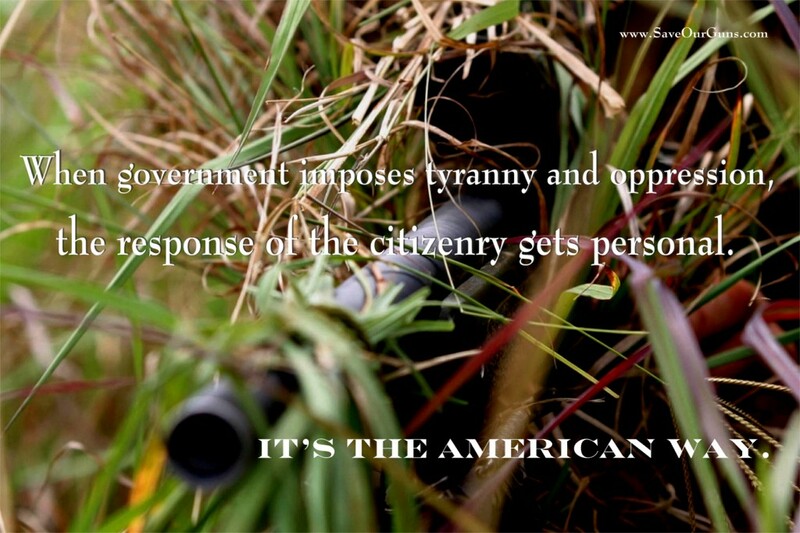 The message: the Individual Right to Keep and Bear Arms is YOUR RIGHT - YOUR DUTY. Save Our Guns has THE GUN RIGHTS RESOURCES that capture positive images of firearms and your Rights. You can DISPLAY AND DISTRIBUTE THESE ITEMS to educate other people about THE RIGHT which protects all other Rights against tyranny and oppression. Also, check out our FREE POSTERS YOU CAN DOWNLOAD PLUS our New PHOTO QUALITY PRINTS. Join your fellow Americans in passing the ammunition of truth in the fight to Save Our Guns. A Special Thanks to my son who helped originally set up this site. His technical expertise made this site possible. Revisions are in process.